Discovering the best compound bow and learning how to use it is a journey all its own, especially for young people. Being a novice archer means you will need to learn what the old-timers already know. The greenhorn can be snowed under with all the mountains of choices that can be traumatizing. We won’t let that happen to you with our Compound Bow reviews, discussion, and Guide for you to read about. You will learn what features you need and don’t need for victorious shooting. There are many things to consider when you are a beginner. The options are many and varied. You will need to know such things as the draw length and weight, shape, and maybe color. A beginner’s bow is never as robust as a seasoned veteran’s bow with his or her years of experience. As the old saying goes, “you have to learn to crawl before you can walk.” When you are just starting out, you will need to learn the skills from the experts. Like shoes that don’t fit or food that tastes bad, a beginner can lose interest in archery or shooting for sport and food when the bow is the wrong size and doesn’t fit. The exact and perfect draw length is a critical decision to make. This will be contingent upon the size of the person. To find this length, stretch both arms straight out to your sides. This will be your wingspan. Have someone measure from your left hand’s longest fingertip to your right hand’s longest fingertip, and this will probably be the middle finger. This measurement decides your draw length. If your wingspan is 61-inches, your ideal draw length is 23-inches. When your wingspan increases, your draw length will grow by one-half inch. In other words, when your wingspan increases to 65-inches, your draw length will now be 25-inches. Adjustable draw lengths are available for the fast-growing youngsters learning to shoot. This method will help with the budget too. Your wingspan should be in the range of 2.5 times larger than the draw length itself. Beginning youngsters might think they are as strong as an ox, yet they are not. Older people might have the edge on strength however. The draw weight for the learners is 75% of their strength. When a bow is too hefty and weighty, the newbie will become tired very fast. When you’re tired, you don’t want to mow the lawn or stay with archery training. For a day or weekend of shooting or hunting, the new archer needs to be fit and have a bow without too much draw weight. It’s not so important in the beginning to have the bow shoot off with extreme power of superman. The day will come when the new hunter is stronger to realize the extreme power when using a bow with a heavier draw weight. Nothing beats a failure but a try—so keep on keeping on with youngsters so they will love the sport and excitement it brings. My dad taught me, and I was a tall gangly skinny girl! Going up a tree and sitting on the tree strand for the deer is easy now that I’m stronger and older. A beginner would be best off using a 15-pound draw weight if he or she is less than 70-pounds in weight. At a weight of 70- to 100-pounds, a beginner can go to 25-pounds of draw weight and no more. At 100- to 130-pounds, a youngster or a female of the same frame and weight can use 35-pounds of draw weight. Go up 5-pounds for ever increase in weight of 30-pounds. For a large sized man, 75- to 80-pounds draw weight is enough top end. The bow length is another important consideration for newbies. It is based upon the size of the youngster and what can be handled comfortably and functionally, not on the child’s height. Have the child take a stab at different lengths to see how it feels and fits. Measure the distance between the axles where typically it will be 30- or 32-inches. Beginners will need to know the speed from the bow for the traveling of the arrow. Bow speed is measured in FPS (feet per second). The draw weight establishes the FPS. The larger the draw weight number, the faster the bow will travel due to the release force. The arrow will fly faster to the bull’s eye, or the bull elk, when the FPS is higher. Beginners will usually have a lighter draw weight, so they should not be too disappointed at the slower FPS. When you buy an adjustable bow, you can increase the draw weight as necessary for the new shooter. It takes some time to become accustomed to this new discipline. Youngsters need to prove good habits from their trainer experts. The latest innovative bows have 350 FPS and that is a lot of power for a young person to handle. The bow’s speed creates sound. You don’t want to startle and scare off the wildlife you are hunting. You might be wondering what causes the sound. It is the residual vibration after the arrow leaves. Add vibration dampers to your bows to reduce sound so that you won’t scare the meat for dinner. As an experienced archer, you will find your compound bow and accessorize it to the hilt, while beginners might not have a clue. It’s up to the beginner, and the parents to advise and guide. Bare bows are naked of the arrow rests, sights, quivers, and noise dampers that are outfitted on the bows that come ready to shoot. The bare bow needs time and thinking to get it right. For the bare bow, you will need to think about the bow style, risers, cams, limbs, and anything else and be sure it all fits that particular bow. On the other hand, the bow that has been fitted with all the stuff, is usually a better deal overall. The beginner might not consider let-off until the first shot has been fired. The let-off is a way to reduce the user’s strength amount to pull back when releasing the bow. This lets the bow be comfortable for a beginner to fire. Experienced archers will know that the let-off of about 75% or more is common for specific bows. However, a bow with a draw weight of 70-pounds, will need only 17-pounds of draw when the bow has 75% let-off. With the let-off that low, the beginner can fire a more powerful bow without becoming exhausted after a few shots. The archer can take more time aiming with greater let-off not being concerned with quick shots. The true length of a bow is the distance from axle to axle. Do not measure beyond the axles. These areas do not affect the draw and release of the string. Today’s latest compound bows are about 32-inches preferred by experienced hunters. They fit well into tight spots. Longer bows of 36-inches are used for competition shooting. Youngsters are more comfortable with 25- to 30-inches since the youngsters are shorter and smaller in size and shorter ones are better for tree stands. All cam systems do not work the same. They all have a related mechanical goal each having qualities, characteristics, traits, and features with benefits and nuisances of technical behaviors. Since the bow’s string technology is better, it’s difficult to say that one cam type is better than another. This cam is a modified 3-groove twin-cam that is responsive to both the top and bottom cams and not to the limbs of the bow. There is no split harness on the binary cams as with the single and hybrid cams, with only two cam-to-cam control cables. Therefore, the cams pull on the opposing cams, not the opposing limbs. This system is fast and easy to tune. Twin Cams are also referred to as a Dual Cam or Two Cam system. It will encompass 2 round wheels or elliptical cams on each bow end. These must be synchronized to give nock travel, speed, and accuracy. This system once needed more maintenance to be in top condition when shooting, but with today’s string fibers that do not creep, the new bows need less upkeep. It is inclined to have more noise than the hybrid or single cams, but is a preferred choice for experienced shooters and beginning youngster bows as well. This cam scheme has a round idler wheel on the top with an elliptical power cam on the bottom of the bow. It is quieter and easier to care for than twin cams because there is no synchronization to do. Single cams might not provide straight and level nock travel and that can make it difficult to tune these bows. Some of the single cams are aggressive and fast while others are silky and smooth. The single cams are popular on today’s compound bows. This system has two asymmetrically elliptical cams with the control cam on top and a power cam on the bottom. It has a single split harness, control cable, and a main string. Hybrids tout straight and level nock travel such as the twin cam bow, with no sync or timing problems to deal with. They do need to be timed for efficiency and performance. There are quiet and fast hybrid cams equaling the best single cams available today. Women are hunting more than ever and compound bows are the choice. If they do not hunt, they are involved in archery sports. The bow manufacturers have changed their designs and changed their ways for selling bows, a once male dominated adventure. They were designed for a man’s arm, and are now offered in the market place for varying sizes and shapes. This makes the current bows ideal for all shooters, whether male, female, youngsters of all ages and body sizes. For you female readers, rather than trying to use your man’s bow, or a cheap kid’s bow, check out the bows for women. Over the last 5 or so years, women have been archers for hunting or sport and that is growing by 5% a year up to 17 million in 2014. Gear is now being made specifically for women. Women’s bows are no longer pink, although the youthful girls still like hot pink! Bows for women are highly precise and powerful just like the men’s except in a smaller package. Draw Length—women are usually shorter than men so the draw lengths are made shorter. Hold your arms out, measure your wing span from middle fingers tip-to-tip and divide that number by 2.5 to get your draw length. Draw Weight—for women’s bows are a bit lower. If this is your first time using a compound bow, start low and build up your muscle strength. When you can draw 40-pounds comfortably, this is the least amount of draw weight you will need for hunting deer. Larger game such as elk and bear will need 50-pounds or more draw weight. Let-Off—is the draw weight percent needed to hold your arrow at full draw. It will be easier to hold steady for a longer time with a let-off of 80%. That will allow you to control your shot with accuracy that will increase exponentially over time. Strings and Cams—for inexpensive compound bows usually have strings that stretch and stay stretched out, never to return to taunt. Better quality bows have improved cam systems with better strings. Total Bow Weight—is the spec you definitely want to check. You will need to be strong to handle a heavy bow to hold it up. If it’s too heavy, you will become exhausted where your accuracy will fall off and you will not enjoy the sport. Recurve Bow—the curved limbs curve to the inside at the curved ends. It is thought that the curving of the limbs gives greater force (velocity) to the arrows. These are made of wood, carbon, and fiberglass. They are used in tight areas with game. It has a single string, and launches an arrow faster than a traditional longbow. A recurve bow is the only one permitted to be used in the Olympics by the contestants. Recurve bows are used in archery competitions. Compound Bow—is a system of pulleys for the strings to pass through. These pulleys (cams) create an enormous force when the archer draws back the bow. The string will pass through the cams a few times. The resistance is reduced after the bow passes a particular point. The arrows will be propelled with more force with the compound bow system. These are best for hunting. Cross Bow—and the compound bow are two different systems. Both shoot arrows. For hunting or competitions, it is necessary to know the differences for what you want to do. The crossbow releases the shot like shooting a gun. It’s not what most think it is. It is not a typical bow and arrow and was used by the Chinese in the sixth century. It is upgraded to be a bow held with a stock and the bow is fired by releasing a lever. With the bow sitting on a wood board, a device draws and releases the arrow. This bow is easy to learn to shoot with a much higher firing range than a traditional bow. A string does not need to be drawn and held in position while the other hand holds the bow such as with the longbow. Crossbows are silent and use less physical energy than a compound bow. They are accurate to 394 yards. The crossbow has a longer firing range than a compound bow. The hunter can be farther away from the game or target. The crossbow is heavier than the compound bow. A compound bow is smaller than a crossbow, thus easier to carry and is silent. A compound bow is more exact than a crossbow. The Genesis® Original is the first compound starter bow ideal for beginners and intermediates of all ages and sizes regardless of athletic abilities. The kids won’t learn bad habits with this bow! Genesis is the official bow for the National Archery in the Schools Program (NASP®). This bow comes in many colors and has no draw length requirement so kids will not outgrow it as they continue to grow. It is all made in the USA to include a machined 6061-T6 aluminum riser, aluminum cam and idler wheel, sturdy composite limbs and high-strength bowstrings. Be sure to choose left- or right-hand. There are no tuning matters to deal with because of its single cam technology. There is less recoil, less noise letting the youngster or you have more accurate shooting. This compound bow eliminates let-off and specific draw length requirements. The light draw weight at 20-pounds can be lowered safely to 10-pounds. The included 3/16-inch hex nut is used to adjust the draw weight. The riser is drilled and tapped for standard accessories. The kit includes the bow, belt tube quiver, adjustable arm guard, and 5 aluminum arrows. Gift-wrapping is available for holidays, birthdays, and special occasions. The bow does not come with a carrying case. You will receive a User’s Manual and a 1-year Warranty. It is made in the USA. The SAS—Southland Archery Supply—is a bestselling compound bow for archery enthusiasts giving them the best opportunity for developing their skills and talent to the fullest. The SAS Rage 70-pound 30-inch bow is most admired and this superior high-quality bow is well worth its value with fantastic features the archer is looking for. The bow is both left- and right-handed. The draw length is adjustable at 25- to 31-inches, the axle-to-axle is 35-inches, and the FPS is 270. For a low bow life, the compressed ABS limb spans balance, weight, and strength, all traits you want in a great compound bow. With its layered limb of super strength, your draw weight will be up to 70-pounds. The damper will lessen vibration when you shoot eliminating sound that can startle wildlife to scatter and flee. The back-pivoting limb pockets house and secure the ABS limbs in place. This gives the bow a strong connection for improved accuracy with enduring rigid tolerances. The riser offers curb appeal to the compound bow. The waffle appearance is achieved with the number of cut outs on the riser. The bow will handle between 55- and 70-pounds of force when you pull back on the string. This will hinge on the setting you have it on occurring before the twin cam idlers activate. One turn of the limb bolt will increase or decrease the weight by 5 pounds. After you release the string, the arrow will launch at a dazzling speed of 270 FPS. The bow has a concealing autumn camouflage color. The bow can be fitted with a fishing rig if you like and it can be used with a quiver. The dimensions are 34-inches long by 12-inches deep by 2-inches at its thickest point. Gift-wrapping is available for holidays, birthdays, and special occasions. The bow does not come with a carrying case, sight, rest, or D-ring. The full accessories package or pro package at Amazon.com® offers these options. You will receive a User’s Manual and a 1-year Warranty. The Diamond Archery™ Infinite Edge Pro is a high-end quality distinct and versatile archery compound bow. The features are over the top and a top selling bow on Amazon.com®. It has been engineered and created from the bestselling ‘Infinite Edge’ bow by increasing the draw length to 31-inches. This benefits the shooters with longer draws. The cam system has been remodeled and restyled for an impeccable smooth draw cycle for you experienced shooters and hunters in mind. A solid back wall feature was added and it is an edge up from the competition. For perfect balance, a stabilizer has been added so that the bow is ready for no matter what. It is available for left-or right-handed users in black, mossy oak, or pink. For bow-type hunting and recreation, the package includes the Infinite Edge Pro Bow, a 3-pin tundra sight, Hostage XL arrow rest, Deadlock lite Octane brand quiver, tube peep sight, BCY string loop, a comfortable wrist sling, and a 5-inch ultra-lite Octane brand stabilizer. The Infinite draw setting is perfect for multiple bow shooters. No release is provided and no arrows come with the package. The dimensions are 34-inches long x 12-inches deep x 5-inches wide and it weighs 3.1 pounds. Gift-wrapping is available for holidays, birthdays, and special occasions. A carrying case is not included. You will receive a User’s Manual and a Lifetime Warranty. The Bear® Archery Escape Compound bow, model A6ES20006R camo pattern Realtree Xtra® Green, is right-handed, (left-hand available) powerful, and the jewel of Bear’s® arsenal of bows. The compound bow weight is lighter due to the strong 7075 aluminum riser that distributes limb loads evenly. The H15 Hybrid cams give you the balance you want in strength and weight when shooting with an easier draw and letdown. With the 6-inch brace height and axle-to-axle of 32-inches, you will never feel cramped or the bow too long when hunting. The stabilizing bushing is made of strong stainless steel. The barrel nut is high strength for adjusting the way it works best for you with its pivoting limb pocket. The adjustable SonicStop™ offset string suppressors are adjustable bi-dimensional to deaden vibration creating sound when you shoot and made of rubber. The max preload quad limbs ensure you of more power while the hinge guard lessens lateral torque when shooting. With the VersaGrip™ grip system, your grip is secure and the SonicKnots™ will not slip or slide apart. It also has a great solid backwall. Peak Draw: 45-60, 55-70 lbs. Gift-wrapping is available for holidays, birthdays, and special occasions. You will receive a User’s Manual, rotating module, and a Limited Lifetime Warranty. To the original owner, limbs are 100% covered at no charge for the first 5 years and 50% of replacement cost after 5 years. Risers and cams have a Lifetime Warranty. The bow is imported. 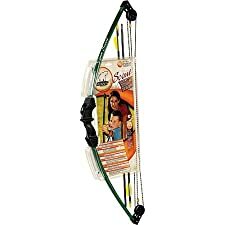 The Bear® Archery Scout for youngsters or beginners is a compound bow, camo pattern Realtree Xtra® Green, is right- or left-handed perfect for kids 4- to 7-years-old. Pick their favorite colors of purple, light green, orange, or teal as a surprise gift, or let them choose it on a whim. Or, choose the Realtree Xtra in many colors. Your kids will learn lifelong skills when you teach them archery with the Scout set. The skills kids learn are patience, focus, concentration, attention span, coordination and survival proficiencies. It comes with all the pieces necessary to get started right out of the box. An armguard, Whisker Biscuit arrow rest, finger tab, 4-pin 0.019 fiber optic sight, D-ring, 2 Safetyglass™ arrows, and quiver will have them beaming with delight. Teens can start their fun with this pull, aim, and fire compound bow set. Set it up in the backyard or field where your kids can enjoy learning about shooting while doing it. It does not come with a carrying case. The bow is made of aluminum, and is sturdy and strong with its attached string, arrow rest and pulleys. The handbook for youngsters has systematic instructions and illustrations for quickly setting up and shooting. With its max preload quad limbs, you are assured of power. The grip is designed to do away with hand torque for better accuracy. The adjustable SonicStop™ offset string suppressors are adjustable. It peaks at 67 pounds with a 27-inch draw. Gift-wrapping is available for holidays, birthdays, and special occasions. You will receive a User’s Manual, and Youth Bow 90-day Limited Warranty to the original owner. The bow is imported. We hope this has given you some useful information for buying a best compound bow for yourself, your youngster, or anyone else having an interest in archery. Be sure to always read brand reviews to see what others have to say about a bow you might have interest in. Watch for a Warranty of a year or more. Happy hunting for your bow and happy hunting with your bow! Which Best Bow Release To Choose – Wrist Or Hand Release? Longbows for Sale: Finding the good one!